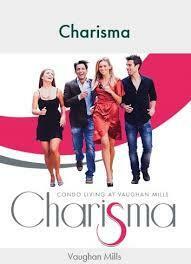 CHARISMA CONDOS AT VAUGHAN MILLS GREAT OPPORTUNITY TO LIVE & INVEST IN VAUGHAN!!! Welcome to The Charisma Condos Vaughan Mills a new condo project by Greenpark Homes, Very well-known and well reputed builder in construction industry. Charisma Condos will be a great living and investment opportunity, a prominent condominium project and elegant condo living just steps from the Vaughan Shopping Mall, Canada Wonderland, Vaughan new Downtown and Vaughan Future Subway Station. Charisma Condos will be consist of six mid to high rise towers with 2050 mixed condo units. Charisma Condos is located at Jane Street right in front of Vaughan Mills world class shopping mall, close to Vaughan new Downtown and Vaughan Metropolitan Centre, Vaughan proposed Hospital. Easy access to public transit, Grocery Stores, Schools, major highways, hwy-401, 404, 407, 427, York University and University of Toronto. THE CHARISMA CONDOS VAUGHAN MILLS* GREAT VALUE AND INVESTMENT OPPORTUNITY IN VAUGHAN CLOSE TO SUBWAY!! !